One year ago at this time we were getting ready for our move to Camp Shiloh. Now, we are making plans for our move back! Watch your Eagle Updates for news about the move, and please plan to come to our April PTSO meeting on April 9 at 6 pm in the library if you would like to have a part in the festivities we plan! We want LOTS of parents and families to be a part of this fun and even historic event! Please read on for important announcements and dates, and mark your calendars! 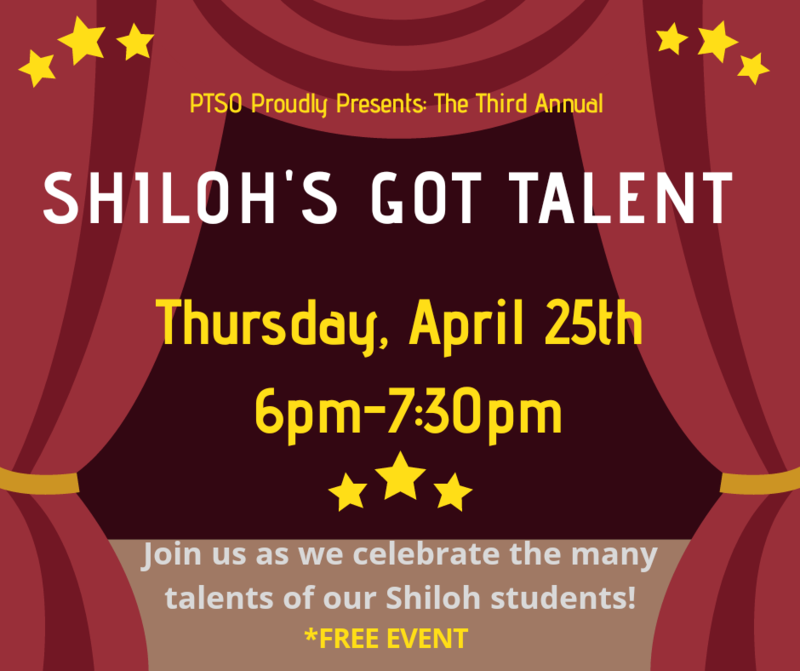 We hope your 3rd-6th grader will consider signing up for the third annual "Shiloh's Got Talent" Talent show! 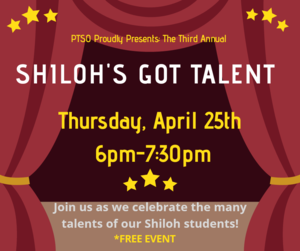 The talent show is Thursday, April 25, from 6 - 7:30 pm in the Camp Shiloh Gymnasium. Children may pick up forms in the office this week and they are due by Tuesday, April 9. Acts will be previewed Thursday and Friday, April 11 and 12. All acts must be previewed and no act may be changed from the act that is shared during the preview without permission from our PTSO. In addition, we need your help, parents, as we try to grow respectful, polite kids. We ask that all parents emphasize for their children the importance of being a great audience for all of the other performers, both before and after performing. Side talk, rehearsing acts, entertaining younger siblings, playing on cellphones--these are highly distracting to those brave kids who are having their moment in the spotlight. Families of early performers are invited to stay for the entire show to honor all of the other performers and keep disruptions to a minimum. Thank you for supporting our PTSO with our chocolate fund raiser! Chocolate will be available for pick up after school on Wednesday, April 10. We are sorry to say that the Silverwood reading program changed this year, and due to a miss in communication between their corporate office and our school, we did not learn of the change until it was too late to apply for enrollment int the program. It is now called "Read 2 Ride". We will definitely apply for next school year, but in the meantime please accept our apologies. We know many families look forward to this every year. Help! We are very low on extra clothing in our health room. We use extra clothing when children have accidents at school, or get sick on their clothes, or fall in a puddle on accident ("accident" is the key word!). If you have Shiloh Hills clothing that has somehow made it into the kids' dressers and closets, please send it back so we can re-use it. We welcome small donations, particularly in sizes 5 - 8, both boys and girls. Our field is super saturated with melted snow right now. Rubber boots for recess are an excellent choice. Packing a change of shoes for after recess is another great idea. For safety, children may not take off their shoes inside the building, so a dry pair to change into is helpful. Please plan for your first or second grader to arrive at school between 6:15 and 6:20. Front doors will be unlocked at 6:15. Parents should plan to go directly to the gym, taking children's coats with them. Students will sit at their assigned cafeteria tables and enter the gym led by their teachers. You may have already marked your calendar for the School Carnival, but please note that the date has been changed and is now May 22 from 5:30 - 7:30 pm. Your kids recently had some lentil chili along with a tortilla chip for dipping courtesy of Spokane County FoodSense and Washington State University Extension. This chili had rave reviews! Look below for the recipe, attached at the end of this post. We encourage you to make this with your kids! It is a very inexpensive (just pennies to make it) and it is a highly nutritious meal or snack.